The GP140 Abstile Gloss Plastic Watch from Swatch is part of the Gent Family and the Originals Line. The Abstile features a pint glossy translucent case which holds a easy read dial powered by a Swiss Movement. The Strap of the GP140 is a flexible plastic with a glossy finish on the top for increased water resistance. 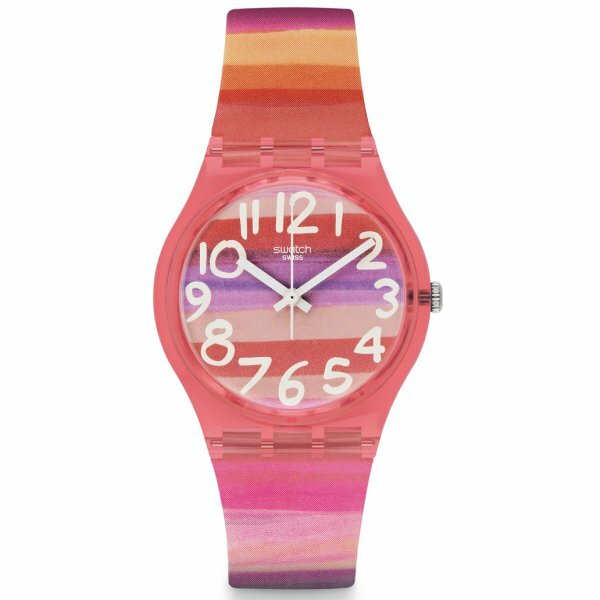 All Swatch watches feature classic Swiss Design with the robust and reliable Swiss movement powering every single one. The Absitle watch features a stripped multi-coloured design across the strap and dial. All GP140 come with a 2 Year Manufacturer Warranty thanks to Tic Watches being Official Stockists.